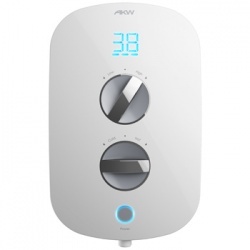 AKW iShower range or Electric Showers. iTherm, iSure, iCare. AKW’s new range of iShower electric showers has been beautifully designed with you in mind. Whether you’re using our showers or installing them, you’ll find the great features and technical innovations make your life just that little bit easier. 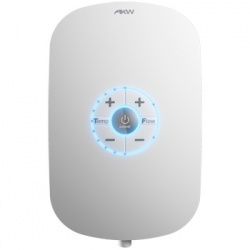 Browse the range of SmartCare Plus, iTherm and iSure electric showers. SmartCare plus : Contemporary styling combines with advanced technology to create the world’s first Bluetooth® Smart enabled electric shower. 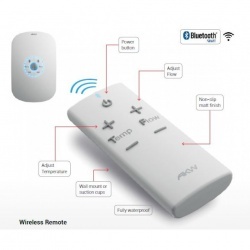 Offering unrivalled levels of control, safety, ease of use and style, SmartCare Plus looks good however you look at it. iTherm : Intuitive design puts you firmly in control. The LED display, Power push-button and independent Temperature and Flow controls ensure the perfect thermostatically stabilised shower every time. Simple, stylish and safe for all the family. iSure : Clean white lines and a high gloss exterior accentuate the simple elegance many interiors call for. 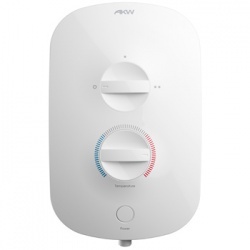 Controlled by individual mechanical Temperature and Flow controls and an easy push Power button which maintains your ideal settings for next time.